FIVE opinions and recommendations on things: shredding outdoors, books, music, outdoor gear, tech, training and mental fortitude... Oh, and one picture from the week. Enjoy. Pic of the week: a few weekends ago I was in Moab, Utah. My aim was to play outside and train hard. 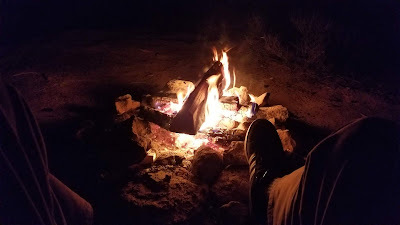 I also got some camp fire time in... Kind of a lame, between-the-legs view, but thought I'd share. I've been looking at new boxing gloves for my heavy bag workouts and I've settled on the https://www.amazon.com/gp/product/B00PCEHH4G/ref=ox_sc_act_title_1?smid=ATH51J1IZT4F9&psc=1 the RDX Elites have a great fit and incredible protection. What I really like is how the wrist strap is easy to lock down with one glove on.